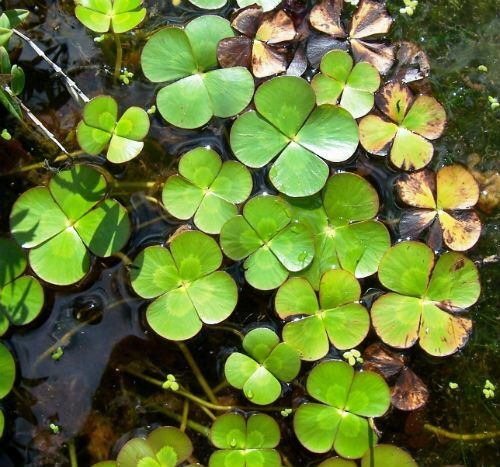 Marsilea mutica, Banded Nardoo, is a member of the Marsileaceae family. There are about 65 species worldwide with 6 endemic to Australia. They are aquatic ferns that grow in wet soils and still to slow moving water. M. mutica has a long, creeping rootstock. The fronds resemble aquatic four-leaf clovers. Each leaflet is up to five centimetres long, wedge-shaped, bright green with a brownish band about halfway along the frond. M. mutica has spores held in a sporocarp. These are hard capsules that are modified leaves. They are 0.3-0.5 centimetres long, and globular in shape. The sporocarps protect the spores during dry periods. They open readily once wet and release the spores into favourable conditions. Aboriginal people ground the dry capsules to produce flour for baking. If consumed without baking this may induce Beriberi, a vitamin B deficiency. The explorers, Burke and Wills, were the most famous casualties. They ate large quantities of raw nardoo flour. King, another member of the expedition survived because he ate baked “nardoo cakes” prepared by the local Aborigines. M. mutica is found in the eastern parts of NSW and the northwest, all the other eastern states as well as South Australia, Western Australia and the Northern Territory.